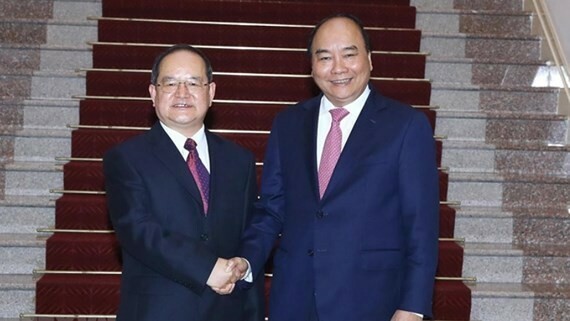 Vietnamese Prime Minister Nguyen Xuan Phuc yesterday made a reception with Lu Xinshe, Communist Party Secretary of Guangxi Zhuang Autonomous Region of China on the occasion of his visit to Vietnam. PM Nguyen Xuan Phuc highly appreciated the good trade relationship between Vietnam and China in recent time. With the advantage, the PM suggested both nations to tighten the good friendship between border localities, and strengthen further cooperation relations with Guangxi province in the fields of economic and commercial exchanges. The province of Guangxi accounts for a quarter of total bilateral trade turnover between Vietnam and China, therefore PM Nguyen Xuan Phuc desired that the trade relations between the two countries would continue to have good achievements in the upcoming time. The PM also suggested authorities of Guangxi province to create more favorable conditions of customs procedures at entry border gates so that Vietnamese goods could approach Chinese market. On the occasion, Mr. Lu Xinshe respectively met the Northern provincial secretaries of Quang Ninh, Lang Son, Cao Bang and Ha Giang.